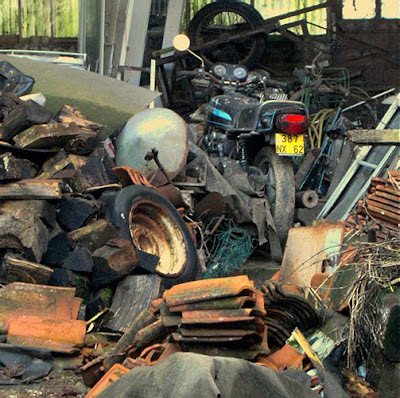 Instrumentation: violin, 12 brakedrums, 6 flowerpots, plumbers pipe, damped plumbers pipe, wind chimes (glass & metal), 2 sistra, temple blocks, dustbins, spring coils, cymbals, congas, gongs, double bass laid on its back and struck with sticks, snare drum, tom toms, maracas, 2 triangles, tin cans. Lou Harrison's Concerto for the Violin with Percussion Orchestra calls for these instruments. A wonderful and genuinely accessible work from a composer who should be much better known. 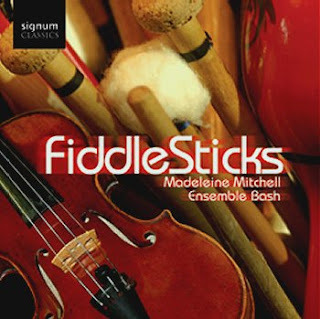 Below is the recommended recording from Madeleine Mitchell violin, Ensemble Bash and Karen Hutt percussion. Lou Harrison's Fifth Simfony (yes really) is here. On thing that I have never understood is why that Signum Classics CD does not say that the main work on it is the Lou Harrison Concerto - the rest of the works are really very worthwhile bits and pieces. I wonder how many more copies would be sold if Lou Harrison's name was on the artwork? Signum Classics do some fine things, but they also do some very strange things. His music, surprisingly, is sounding better with each passing year. Thanks for the reminder.